Benefit Cosmetics like to say that brows are just like hair. The same way a new hairstyle can be life-changing, a new brow style can be positively transformative. I’ve definitely found that getting my brows done definitely helps turn that frown upside down, and a great brow service will leave you walking on air. Sadly, if you aren’t blessed with Delevingne genes or a celebrity MUA at your disposal, actually achieving that ideal is difficult to say the least, and knowing where to start is even harder. So those lovely people at Benefit Cosmetics - reportedly the #1 Brow Brand Worldwide (based on estimated total global prestige brow product retail sales from July to September 2016) with over 2,100 BrowBars in 42 countries - is introducing four new brow “styles” that are sure to lift your look and make you feel that much fancier. “We’ve noticed that there were most popular and sought after trends from around the globe and simplified into four timeless and universally flattering arches that ANYONE can master” says Jared Bailey, Benefit’s Global Brow Expert, and all four are available at your nearest Benefit BrowBar beauty lounge so you too can get the “total brow package”. Feathered Brows – because feathery, brushed-up brows are definitely in. Since celebrities with bold brows came on the scene, many have been left scrambling to rectify the overly plucked brows of our youth to no avail, resulting in arches that are passable but ultimately uninspiring. “Feathered brows signal an effortless presence that need not a bold lip or flick of mascara. They’ve got your face covered,” says Bailey. All you need is the help of Precisely, My Brow Pencil, an ultra-fine brow defining pencil that makes creating hair-like strokes for shape, definition and structure a cinch. Finish off with 24-HR Brow Setter, 24-hour invisible shape and hold gel to enhance the feathery hair texture. Zings, a pocket-sized compact that has everything you need for sharp, defined arches. Simply draw out your desired shape with the pigmented wax, and fill and set with the pigmented powder. Highlight the brow bone with High Brow, a pencil with a creamy, blendable formula for the look of an instant brow lift. Straight Brows – the ultimate in current K-Beauty style, celebrities and beauty gurus across the globe are opting for a soft, straight across brow look. Dropping the arch, the Straight Brow instead features the slightest taper off towards the tail. Both flattering and versatile, when done subtly, it gives you an innocent and youthful look. “To create this look, brow thickness should be consistent from the start to the arch” says Bailey. Use ka-BROW! eyebrow cream-gel colour to easily fill, sculpt and define your brows, then add subtle highlights to your brow using 3D Browtones. Simply switching from an Arched brow to a Straight brow gives you a completely fresh and flattering new look, and it’s easy when you know how. Natural Brows – your natural style, but better. And yep, it flatters everybody. For the perfect ‘I woke up like this’ arches that make on-the-go beauty a reality, opt for the Natural Brow. Start with Goof Proof Brow Pencil, and once you’ve filled in any patchy areas, switch over to Gimme Brow, the brand’s award-winning volumizing fibre gel. Gimme Brow’s brush on gel contains tiny microfibres that stick to your skin and hairs, creating natural looking fullness for those visibly thicker brows you’ve always dreamed of! "Dimension in a filled brow is super important for making it look like you were born with beautiful brows,” says Bailey. Now on to the part where YOU get the treats! 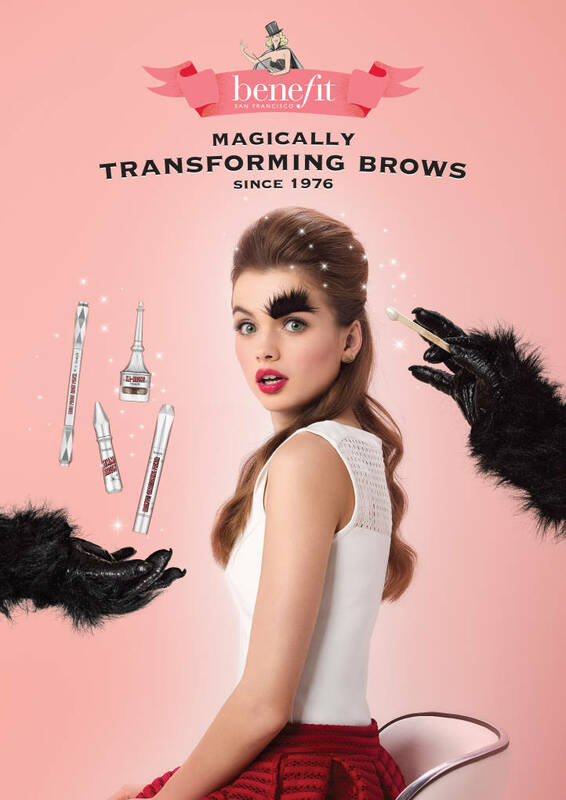 I am giving away four Benefit Brow Style Services, with each prize redeemable at your choice of the following NZ Benefit BrowBars: Benefit Boutique Ponsonby Auckland, Smith &Caughey’s Queen St., Smith & Caughey’s New Market, David Jones Wellington and Ballantynes Christchurch. Each service is valued at $39.00 and includes a Signature Benefit Brow Wax, Tint and Style. All you need to do is follow @benefitnz on Instagram, and then send me a screen grab at helene@mshelene.com and you’re the draw! Comp closes at 5pm this Friday, June 16, 2017. Too easy. Good luck and get to it!